Like most of America, I’ve grown up with Minute® Rice. And for the last several years, I’ve cooked Minute® Instant Whole Grain Brown Rice at least a few times every week. Some weeks, I have it every day in some dish or another. It’s definitely a staple in my pantry! That’s why I was beyond excited when I was asked to try the new Minute® Ready to Serve Rice products. Thank you, Minute® Rice, for sponsoring this post. All opinions are my own. When I first noticed Minute® Ready to Serve Rice in its individual portion packages, I didn’t buy it because I tend to buy the largest boxes of Minute® Instant Whole Grain Brown Rice that I can find at my local grocery store. So I was delighted when I discovered a number of new flavor (and whole grain) options in the Minute® Ready to Serve product line, including Brown Rice, Brown & Wild Rice, Multi-Grain Medley, Jasmine Rice, White Rice, Chicken Rice Mix, Yellow Rice Mix, Fried Rice Mix, and (the newest addition) Black Beans & Rice. While I’ve mastered using Minute® Instant Whole Grain Brown Rice in my Harvey’s One-Skillet Wonder, I was curious to try the single portion servings because they are portable, offer easy portion control, and require only heating since they’re already cooked. I hate (yes, HATE!) going out to eat for lunch at work. 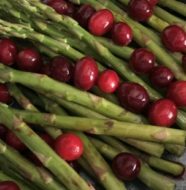 In addition to the high cost of eating out, it’s time-consuming, inconvenient and there’s little control over the quality (or wholesomeness) of the ingredients used. After seeing a HUGE-mongous number (over 70 and counting!) of Minute® Ready to Serve Rice Stir It Up! “No Recipe Recipes” for smarter snacks and easy meals on-the-go, I was inspired to create my own stir-in ideas with ingredients from my kitchen. 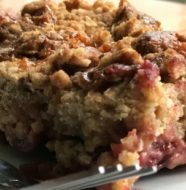 And after a holiday season of irresistible sweet treats, I was committed to discovering some wholesome snacking options that I could easily incorporate into my day (at work or on the weekends). My first inspiration was an Italian Vegetable Blend. I heated 1/2 cup of frozen Italian Blend Vegetables in the microwave until hot (about 2 minutes) before stirring in one heated portion of Minute® Ready to Serve Brown & Wild Rice. 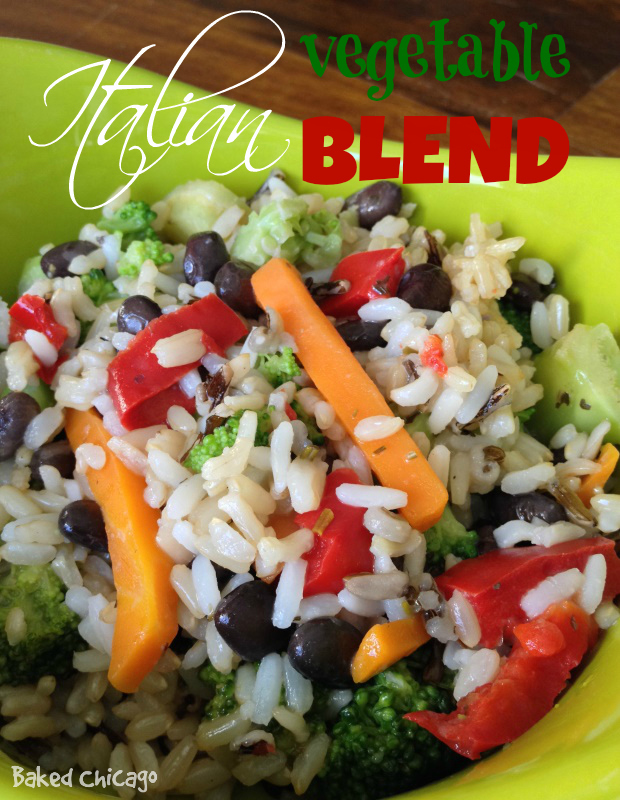 The frozen Italian blend I used included broccoli, carrots, bell peppers and black beans. I then sprinkled about 1/2 teaspoon of Italian Seasoning on top and stirred well. This was “molto buona.” The red bell peppers, black beans and rice blend was just enough for a light meal, side dish or snack. It could easily be turned into a heartier lunch at the office with the addition of some grilled, Italian-style carved chicken breast. I love breakfast any time of the day, but admittedly don’t often have rice for breakfast. 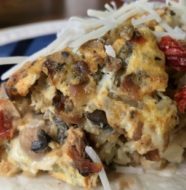 So I took three ingredients from my refrigerator that I’d normally use in making scrambled eggs or an omelet: sausage, cheese and sun-dried tomato. 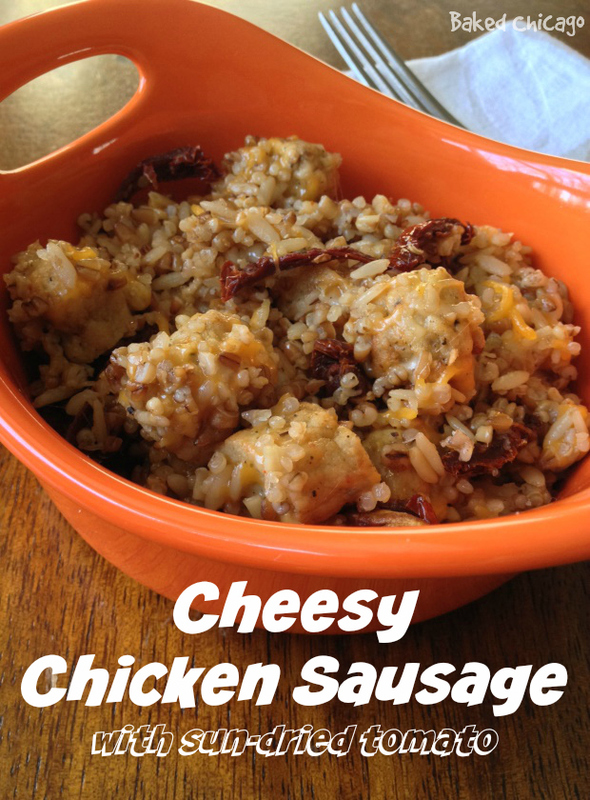 The result was my Cheesy Chicken Sausage with Sun-Dried Tomato dish, which would be a perfect hot (and quick) breakfast on a cold winter morning. Just heat one serving of Minute® Ready to Serve Multi-Grain Medley and set aside. In a small bowl, heat 3 chicken sausage links (cut into 1/2-inch slices) and about 1 tablespoon of sun-dried tomato (Julienne cut) for about 2 minutes in the microwave. When done, add the Minute® Ready to Serve Rice and top with 2 tablespoons of shredded cheese (I used a Mexican Taco blend) and stir well. This would also be a great (and hearty) weekend lunch option when you’re not in the mood to spend time cooking over the stove. After a flurry of holiday cooking, I realized I had some left over dried cranberries that I needed to use or lose! I decided to take some frozen mixed vegetables, along with jarred sliced mushrooms, to create a holiday-inspired Cranberry Rice Pilaf. If you’ve made rice pilaf a lot, you know there are a zillion versions of rice pilaf recipes out there. Use whatever ingredients you have on hand and that you love most. To make my version, heat one serving of Minute® Ready to Serve Brown Rice in the microwave, according to package directions, and set aside. In another bowl, heat about 1/2 cup of frozen peas and carrots with a few sliced mushrooms (if available) for about 2 minutes on high. Remove from microwave and mix with Minute® Ready to Serve Rice. Top with about 1 tablespoon dried cranberries and stir to mix thoroughly. 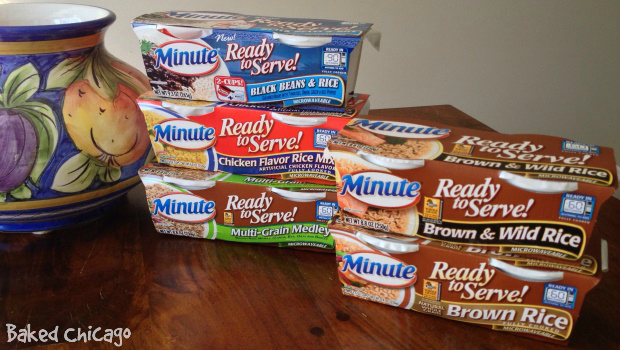 I literally bought every flavor of Minute® Ready to Serve Rice carried by my local grocery store. I’m excited to try the Black Beans & Rice and continue experimenting with other stir-in ingredients from my pantry. 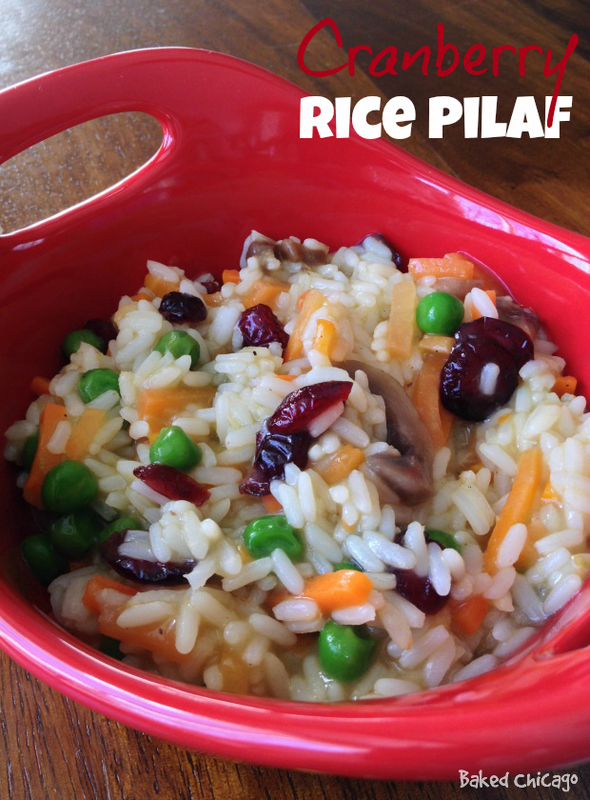 Check out the complete list of Minute® Ready to Serve Rice products and share with me in the comments section below what stir-in ideas you’re inspired to try in creating a wholesome, yummy snack on the fly! This is a sponsored post written by me on behalf of Minute® Ready to Serve Rice.